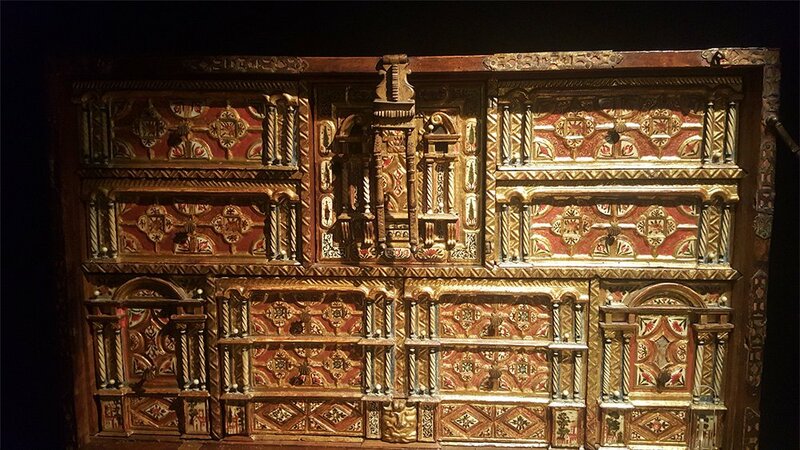 Antique Furniture is one of the most fascinating sections of antique collecting. Primarily because so many of us naturally do what’s most important when collecting antique furniture. We buy what we like. Most antique furniture tends to be purchased by ordinary everyday people, rather than dedicated antique furniture collectors. In other words, more vintage furniture is acquired for its beauty and function rather than the profit potential of a piece. But whether you are looking for a piece of antique furniture for your home or looking for something to sell on; to become knowledgeable about identifying antique furniture takes research. And that is even if you are focusing on only one aspect of this very diverse subject. When trying to identify antique furniture, dedicated antique hunters search for beautifully preserved pieces, armed with pins, magnifying glasses, spirit levels and all sorts of testing equipment. Other interior or home decorators tend not to take things so seriously but are still interested in items, history and authenticity. Many vintage furniture buyers opt for quality reproductions that are more affordable, and either option is fine providing that you research your subject well when identifying antique furniture. There is no exact science where antique furniture is concerned; you simply make an educated decision based on what is most important to you. Becoming knowledgeable about antique furniture takes research, even if you are focusing on only one aspect of this wide-ranging subject. Establish value: Many collectors prefer particular eras, styles, and makers, while others have more eclectic tastes. In either case, an authentic item’s value is influenced and based on its condition, rarity, and history. Get an expert opinion: A trained eye is more likely to find an undervalued treasure (or a clever fake) than a novice ever would. Use the press and stay informed about current trends and potential scams in the antique trade by consulting popular and highly regarded antique trade publications. Consider practical matters Carefully: Always check the size and weight of any piece of antique furniture that interests you. Shipping furniture can be a costly proposition. To reduce these costs, search in local antique dealers and check other sellers who will provide a complete wrap and ship service. There are several ways you can identify an antique furniture item. The first aspect is the joinery; machine-cut furniture was not produced until about 1860. If the piece has drawers, remove a drawer and look carefully where the front and back of the drawer are fastened to the sides of the drawer. If a joint was dovetailed by hand, it has only a few dovetails, and they are not exactly even; if it has closely spaced, precisely cut dovetails, it was machine-cut. Handmade dovetails almost always indicate a piece made before 1860. It’s easy to spot an antique by the drawers because joints were not machine-cut until about 1860. If it has only a few dovetail joints, with pins narrower than the dovetails, then the joint was made by hand. Exact symmetry is another sign that the piece was machine-made. On handmade furniture, rungs, slats, spindles, rockers, and other small-diameter components are not uniform. Examine these parts carefully; slight differences in size or shape are not always easy to spot. A real antique is very rarely perfectly cut; a reproduction with the same components will be because a machine will have cut it. The finish on the wood can also date the piece. Until Victorian times, shellac was the only clear surface finish; lacquer and varnish were not developed until the mid-1800s. The finish on furniture, made before 1860, is usually shellac; if the piece is very old, it may be oil, wax, or milk paint. Fine old works are often French-polished, a variation of the shellac finish. A lacquer or varnish finish is a sure sign of later manufacture. Testing a finish isn’t always possible in a dealer’s showroom, but if you can manage it, identify the finish before you buy. Check the piece in an inconspicuous spot with denatured alcohol; if finish dissolves, it’s shellac. If the piece is painted, test it with ammonia; older pieces may be finished with milk paint, which can be removed only with ammonia. If the piece of furniture is dirty or encrusted with wax, clean it first with a mixture of denatured alcohol, white vinegar, and kerosene, in equal parts. The type of wood is the final clue. Very early furniture, from the Middle Ages until the beginning of the eighteenth century, is mostly oak, but since the end of the seventeenth century, other woods as walnut and mahogany became the preferred choice among the cabinet makers. Around the 1670s they came to recognise the better properties of the walnut, which dense grain allowed for lighter and finer shapes of the furniture, and quickly turned into a most fashionable material. However, in the early eighteenth century, the walnuts in central Europe were nearly extinguished by a frosty winter and its numbers were significantly reduced. 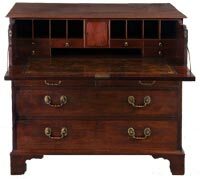 Meanwhile in 1730s mahogany became increasingly popular after it was introduced to England, imported from the British colonies in Honduras and the West Indies. The walnuts quickly became almost entirely superseded by the exotic newcomer, which remained the favourite choice for the next century, especially in England and America. Most antique wooden furniture you will encounter, will either be from traditional English periods or American Colonial styles. American furniture styles have seen a significant number of style periods since the early Colonial era, with each period being to some degree influenced by the pieces being built in Europe (generally England and France). Hybrid of English styles with square lines, solid construction, heavy decoration and carving. Imported wood with interpretations of Queen Anne and Georgian styles. Formal. Windsor chair. Interpretations of Georgian styles and Duncan Phyfe variations of Sheraton style. Some French influences. Heavier versions of English styles. Boston rocker, Hitchcock chair. Solid, plain, Germanic style. Colourful painted Germanic decorations. Severely functional with no decoration. Superior craftsmanship and excellent design.